She considered the earth and its resources in everything she created. Her body was her final offering. The sculpture above is called The Gift of Water and it resides in Grossenhain, Germany. Artist Jackie Brookner was a pioneer in the Eco-art movement. 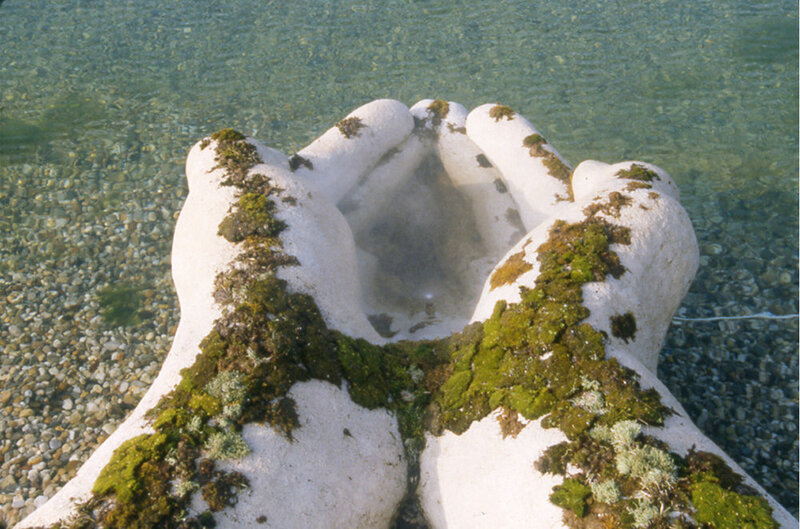 All over the world her functioning bio-sculptures clean polluted water. When she died it was without question that she would be laid to rest with a green burial. Above: One of Jackie Brookner’s living installations—a giant tongue called Prima Lingua installed in La Plaza Cultural Community Garden on East 9th St and Ave C in Manhattan, made before her illness, and the kind of tribute to nature and the sensory realms for which she was renowned. Jackie was wrapped in fabric and placed on a heart-shaped, bark-edged plank of salvaged linden wood.